I am about to jet off to Italy and I couldn’t be more excited! I realize that many people go there to indulge in an abundance of food that can often taste delicious, but that’s often far from healthy, especially when it comes to bread and pasta. It will most certainly be a challenge to find dishes that will accommodate to my better lifestyle choices, but this is a challenge I will face head-on, as nothing can stop me from visiting such a beautiful place. I also have to remind myself that there are already many Italian specialties that are perfectly healthy and that seafood and meat dishes are also abundant. 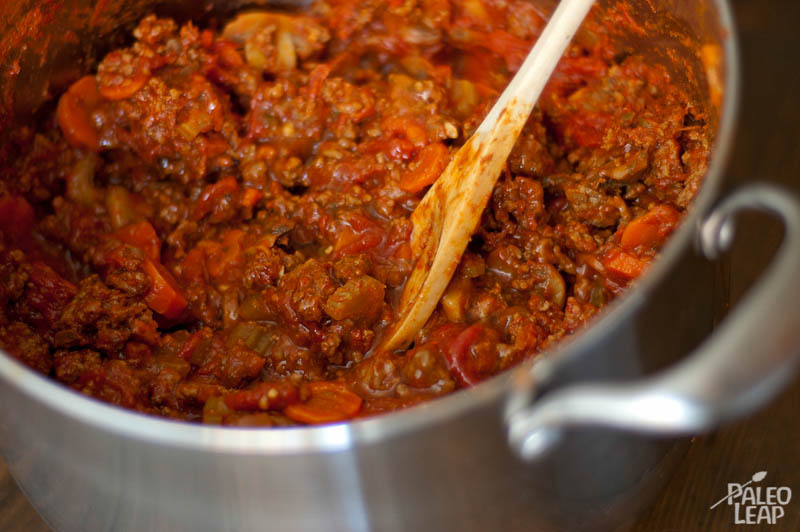 Anyways, in preparation for my adventure, I decided to dedicate an afternoon to making a traditional Italian meat sauce, similar to the one found in the Paleo spaghetti recipe. But, since I don’t eat pasta, I decided to cook the sauce some more to obtain something really thick and filling, something more along the lines of a beanless chili. The result was great. Unlike most chili preparations, this version isn’t spicy at all, which is the version I personally prefer. The beef, coupled with mushrooms and beefy tomatoes, make for a really thick and filling end product. This dish is complete on its own and doesn’t need the addition of the usual beans, which, like most grains, contain undesirable phytates and lectins. Granted, beans are probably a healthier choice then some grains like wheat and corn as well as some legumes like peanuts and soybeans, but it’s still a better idea to keep them off of your diet. This beanless chili cooks for quite some time, but the involvement to prepare it is minimal and the aroma that will fill your house is absolutely amazing. To me, this is what comfort food is all about. In a large skillet over a medium heat, cook the ground beef with some cooking fat if needed. In a very large saucepan over a medium heat, saute the garlic in olive oil. Cook for about 2 minutes, or until the garlic is fragrant. Add the onion, celery, carrots and mushrooms to the saucepan. Stir well and cook for another 5 to 10 minutes, until the vegetables are soft. Add the canned tomatoes, followed by the cooked ground beef. Stir well. Drop in the bay leaves, thyme and parsley. Season to taste with salt and pepper, reduce the heat to low and simmer, uncovered, for about 4 hours or until thick, stirring occasionally. Adjust the seasoning by adding salt or pepper, if needed and remove the bay leaves and thyme sprigs. Be aware, this recipe makes quite a large batch, but it’s great for freezing! You can simply pour individual portions in freezer-proof plastic bags and freeze it. Then, once you feel like having a good bowl of the delicious and comforting chili, you simply have to pull a portion out of the freezer.